Mega Sale! 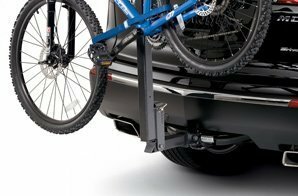 Save 24% on the Genuine Acura Accessories 08L14-E09-201 Trailer Hitch Bike Attachment for Roof Rack by Acura at Our DXC. MPN: 08L14-E09-201. Hurry! Limited time offer. Offer valid only while supplies last. Acura's hitch mount bike attachment attaches to the trailer hitch receiver, allowing you to transport your bike without getting your interior dirty. Acura's hitch mount bike attachment attaches to the trailer hitch receiver, allowing you to transport your bike without getting your interior dirty. Two adult bike capacity. Fold-down feature allows easy access to the rear of the vehicle. Fits: 2003-2013 MDX models.